The Group 2 Moonee Valley Vase is a key support race on the Ladbrokes Cox Plate Day card at Moonee Valley Racecourse on a Saturday in late October during the Melbourne Spring Racing Carnival. The meeting is highlighted by the Group 1 $3 million Cox Plate (2040m), but also features four Group 2 events. Along with this Group 2 the other majors on the program are the Group 2 Moonee Valley Fillies Classic (1600m), Group 2 Moonee Valley Gold Cup (2500m) and Group 2 Crystal Mile (1600m). Contested over the same distance as the Cox Plate, 2040m, the race offers $200,000 in prize money and is a set weights race open to three-year-olds only. It makes a nice lead-up to Flemington’s Group 1 Victoria Derby (2500m) held the following Saturday to kick off the Melbourne Cup Carnival, and the double has recently been achieved by Efficient (2006), Plastered (2004) and Helenus (2002). The latst edition of the Moonee Valley Vase runs on Saturday October 27, 2018. Moonee Valley Vase odds are dominated each year by the colts and geldings, who have a far superior record over the fillies in the race, that come off a run in the Group 1 Caulfield Guineas (1600m) two weeks before. The Caulfield Guineas has produced more Moonee Valley Vase winners than any other race so top three runners in the Group 1 sit high up the Moonee Valley Vase betting markets each spring. Runners under double figures in the Moonee Valley Vase betting odds have an outstanding recent record in the race with no horse saluting at double figures in over 20 years. The latest Moonee Valley Vase 2018 betting odds and links to our markets will be available below the week of the race so stay tuned for the best Moonee Valley Vase Group 2 Cox Plate Day prices. Moonee Valley Vase tips come out the week of the race and are dominated by three-year-old graduates coming out of the Caulfield Guineas. Held two weeks before the Vase over the mile, the Caulfield Guineas is the best lead-up to the Moonee Valley Vase and runners that finished in the money in the Group 1 are a great tip to take in the Group 2 a fortnight later. Other good Moonee Valley Vase tips to take include backing any runners that have previous form over further than a mile, runners that have winning form at the track and those under $10 in betting. Odds-on favourites also have a gun record in the race so taking the shortie has proved a successful MV Vase betting tip over the past two decades. Our Ladbrokes’ exclusive Moonee Valley Vase 2018 Tips and exotic Moonee Valley Vase betting selections will be detailed below the week of the race so stay tuned for the three-year-old stayers to get behind for the win this spring. The Moonee Valley Vase field attracts a quality line-up of three-year-old staying types each spring, some looking to back-up on the short turnaround into the Victoria Derby over more distance the next Saturday. The race is open to both the colts and geldings as well as the fillies and in 2015 Jameka backed-up off a Group 1 Thousand Guineas (1600m) second at Caulfield a fortnight before to beat home the boys in the Moonee Valley Vase. She also won the Group 1 Crown Oaks (2500m) during the Cup Carnival next start and the following year’s Group 1 Caulfield Cup (2400m). In 2017 Aloisia was dominant beating home the boys in the Moonee Valley Vase field by over three lengths after her lead-up Thousand Guineas success. Efficient (2006) completed the Moonee Valley Vase – VRC Derby double during his three-year-old season. Photo Credit: Taron Clarke. Male gallopers often back-up in the race off a run in the Group 1 Caulfield Guineas (1600m) that produced the 2015 MV Vase runner-up Shards (13th) and third placegetter Tarzino (7th). 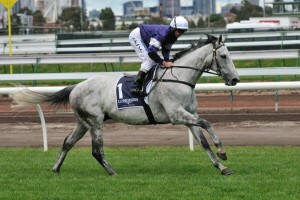 Tarzino went on to win that year’s Group 1 Victoria Derby (2500m) seven days after the Vase. Again in 2016 the Caulfield Guineas form held in the Moonee Valley Vase with Sacred Elixir winning the latter after a lead-up eighth. The 2014 Moonee Valley Vase winner Moonovermanhattan also came off a run in the Guineas (7th), as did Manawanui (2nd) in 2011 who won the Group 2 as the odds-on favourite at $1.18. The last horse to win the Caulfield Guineas – Moonee Valley Vase double was Whobegotyou (2008) who ran second in that year’s Victoria Derby. Another possible lead-up to the final field is Sydney’s Group 1 Spring Champion Stakes (2000m) a fortnight earlier at Randwick, which last produced a winner of the Group 2 in 2013 with Savvy Nature (3rd). The other most recent Moonee Valley Vase winner to finish top three in the VRC Derby next start was Super Cool (2nd in 2012), while in 2010 the Vase runner-up Lion Tamer won the Derby next start. The Moonee Valley Vase nominations close the Monday before the race runs on the Saturday and the final field and barriers are out on the Wednesday. The official Moonee Valley Vase 2018 Final Field & Barriers are announced the Wednesday before Cox Plate Day and will be published in full below so stay tuned to see what VRC Derby-bound three-year-olds make the starting line-up. The early Moonee Valley Vase 2018 entries close the Monday of race week and will be provided for punters below once announced. The Moonee Valley Vase form guide gives you all the information and statistics you need to place a well-informed wager on the race like the jockeys, trainers, barriers, track / distance records and lead-up runs of the horses in the field. The Moonee Valley Vase form has stacked up in the Group 1 Victoria Derby (2500m) a week later many times over the past 20 years or so providing plenty of winners and placegetters in the Cup Carnival classic. Moonee Valley Vase results have been dominated by odds-on favourites and runners under $10 over the past 20 years. Notable recent winners include Jameka (2015), Super Cool (2012), Manawanui (2011), Whobegotyou (2008), Efficient (2006) and Helenus (2002). The official Moonee Valley Vase 2018 Results & Finishing Order will be published below once the race is run and won on Saturday October 27, 2018.